Blondie Headlines: Blondie's New Album Pollinator Available To Pre-Order Now! Plus Download Lead Single Fun Today! Blondie's New Album Pollinator Available To Pre-Order Now! Plus Download Lead Single Fun Today! Blondie have announced their return this year with the release of brand new album Pollinator. Available via BMG on May 5, Pollinator is the band’s 11th studio album. It is preceded by lead single fun, which is available to stream and download now. A limited run of 1,000 copies of Fun will also be released on 7” vinyl, available to order from independent retailers as of today. The single was co-written by TV On The Radio’s Dave Sitek, while guitar legend Johnny Marr and Blood Orange’s Dev Hynes have also penned tracks for the album, alongside. The album’s artwork was produced by artist Shepard Fairey and will be available on CD, digital, heavyweight vinyl and a limited edition 7” box set. An exclusive red heavyweight vinyl is available from Blondie’s official store, while a white heavyweight vinyl will be available from independent retailers. 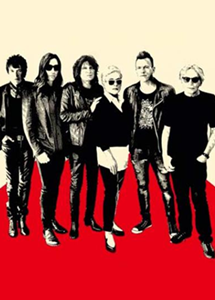 Blondie have recently announced tour dates across Austr4alia and New Zealand, while dates across the UK and Europe, the US and Canada will be added shortly.